Earlier this year Jarrod White and I started a social media project called The Lives of Others. The project aims to raise awareness around mental illness through first-person storytelling. People can submit their story from anywhere in the world by clicking through a link to a survey form on our Instagram and Facebook pages and responding to a series of prompts. It’s been a rewarding experience so far, and a steep learning curve. We’ve received far more submissions than we expected to. This reflects a desire held by people in the community to tell their mental health story and be connected to a network of people who have had similar experiences. What has been concerning is the relatively low submission rate from men. 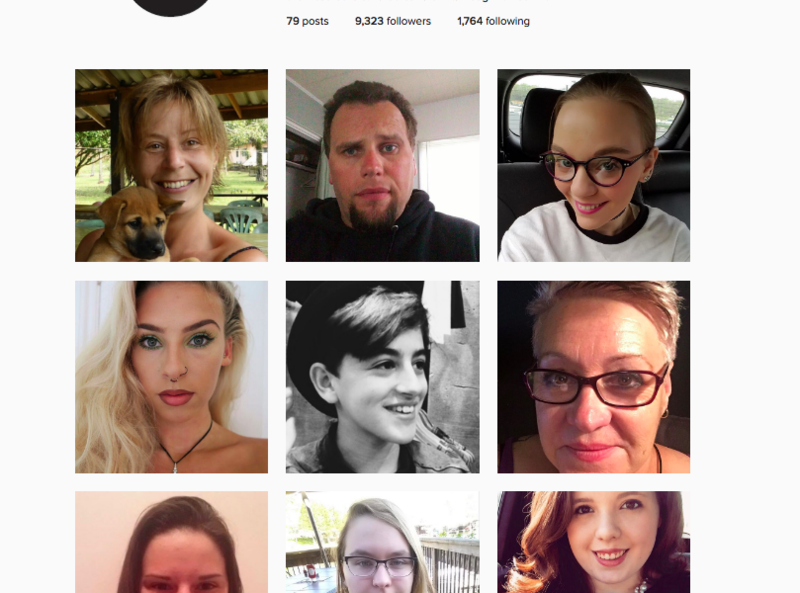 In the first couple of months the project was up and running we had over 120 submissions, and only a fifth were from men. While not surprising, the realisation that men are not talking about their mental health experiences as much as women was still starkly confronting. We wanted to understand what was behind it. Recent figures around the prevalence of mental illness dispel any myth that mental illness is simply less widespread in men than women: the ABS in March 2016 released statistics indicating that suicide rates are three times higher for males than females; according to BeyondBlue, one in eight men experience depression at some stage in their life. So the trend we have observed is not because men aren’t familiar with the full repertoire of mental health experiences. Perhaps it is simply because they are reluctant to speak out about them. Craig Hamilton is a mental health advocate, public speaker and author. I call Craig because I hope he can give me some insight into why men are not submitting to Lives of Others. Craig tells me that when he was diagnosed with depression at age 37, it took him months to seek help, despite being in such a bad way that he could no longer go to work. This isn’t the first time I’ve heard this sentiment expressed by a man: one of the first clients I saw when I was on a student placement at a university counselling service told me that his depression meant that he felt he couldn’t perform the duties expected of him as a man. This left him feeling even more broken. Depression is hard enough without the added shame of feeling like a failure. When I was doing my Masters of Psychology in 2014-15, gender and masculinity was a topic that often came up in conversation amongst my cohort. Josh Muller, who approaches his practice from an intersectional feminist perspective, had good insight in this area. 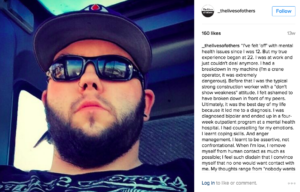 When I ask Josh about the discrepancy between men and women sharing on The Lives of Others, he points out that it’s not just talking about their mental health that many men have trouble with. “The step before asking for help is acknowledging to yourself that you have an issue that you can’t fix by yourself,” Josh explains. “That preliminary step is too threatening to the ego idea of ‘I’m not vulnerable, I’m strong, I can do it myself’.” According to Josh, vulnerability doesn’t accord with the representation of masculinity in Australian society. “There’s a particular idea of what it means to be a man: strong, protector, independent, doesn’t need help, can do everything himself. There’s a focus on physical mastery but also on mental and cognitive mastery over emotions, mastering your feelings. That gets in the way of seeking help.” In a broad sense, men are expected to always be okay. 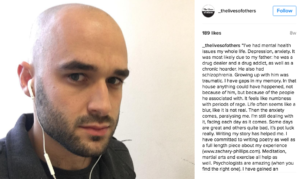 Josh’s take on why men are less willing to come forward and talk about their mental health is consistent with what I found in my research for my Masters thesis. I explored how a person’s gender identity relates to the way that they cope with stress. Stereotypes of male coping hold that men confront a problem either by searching for a specific solution or denying the problem exists. Women, on the other hand, respond to stress through emotional expression and by reaching out to others for social support. So during a stressful period a female may call a friend and talk about what’s going on, whereas a male might go on a weekend-long bender. These coping mechanisms are the result of a process of complex socialisation. If you think about male role models, from a young age we’re exposed to action heroes who solve things through violence. With male intellectual heroes, too, there’s a theme: their mental genius comes through an autonomous and self-driven will, often at the expense of emotional expression and connection with other people. In both cases, the male paradigm is atomised, action-oriented, direct and assertive, and emotionally controlled. Masculinity, in a patriarchal context, sets an impossible standard. Nobody is immune from bouts of sadness, doubt and anxiety. So if having it all together is what it means to be a man, when something goes wrong – being laid off, the loss of a parent, money troubles – their whole identity feels undermined, and the ways that they’ve been socialised to cope, by denying the problem exists or looking for obvious solutions, don’t work. 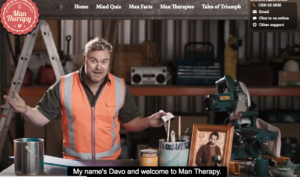 While a resource such as Davo’s Man Therapy, by appealing to ‘safe’ conceptions of masculinity, may be accessing a part of the community that would otherwise be out of reach, I worry that in perpetuating a patriarchal and narrow view of masculinity, it doesn’t allow us to cut through the issue that sits at the core of male mental health issues. Advertising a service with a tough man to reach other tough men is counter-intuitive to the idea of help seeking, of allowing a space for honesty and vulnerability. We can’t address the symptom of a problem with its cause. We can’t address male mental health without separating from dominant conceptions of Australian masculinity. Ideally, a campaign that promotes men accessing mental health services would appeal to many types of masculinity by representing a diverse range of men. In addition to focusing on targeted interventions, we could be focusing on prevention. Prevention of a culture that says to boys and men that you have to hide your emotional fragility; one that says you have to be strong and tough, all the time. On a community level, one way that we could spread this message is through role modeling. We have been pleased to see that when we do post a male’s story on The Lives of Others, what usually follows is a cluster of male submissions. When one male speaks out about his mental health experience, he is a role model for others, normalising it and inspiring others to do the same. It is hard to overlook the power of the internet for accessing young people, and creating user-generated content that can help change the culture around masculinity and mental health. The diversity of voices and diversity of experiences that the online space allows mean that if boys and men don’t identify with the traditional model of masculinity they can look online and find others who don’t fit either. Unfortunately, few policy initiatives genuinely attempt to harness the benefits that the internet and social media can offer, and there is still limited research into their potential. Our hope is that The Lives of Others will encourage other men to share their story in their own words, and in so doing, write their own narrative. Jessica is a psychologist currently based in Darwin working with young people. Her research interests are gender socialisation, gendered coping behaviors, and Aboriginal mental health. Together with Jarrod, she started The Lives of Others in 2015. Jarrod is a Melbourne-based psychologist completing his doctoral thesis on psychological trauma and cross-cultural mental health. He practices at the DBT centre working with an array of mental health presentations, though predominantly borderline personality disorder. He co-founded The Lives of Others in 2015.